This ornament combines a sphere of spalted Missouri hackberry with a top and finial turned from baltic birch. It has been fun to learn some spindle turning this year. I have my own names for the elements of the finial: apple core, umbrella, golf tee, and O-ring–all present in this example. 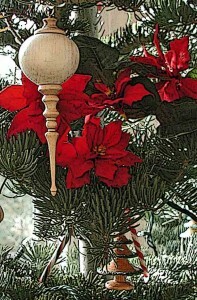 To see a more refined version of this finial layout, visit dennisliggettwoodturner.com. We have a lot of things waiting for attention in the shop and in the sewing room. The Claus household must feel a little like the Liggett’s this time of year!